This is one of a series of portraits I made of members of the City of Tallahassee Senior Center. 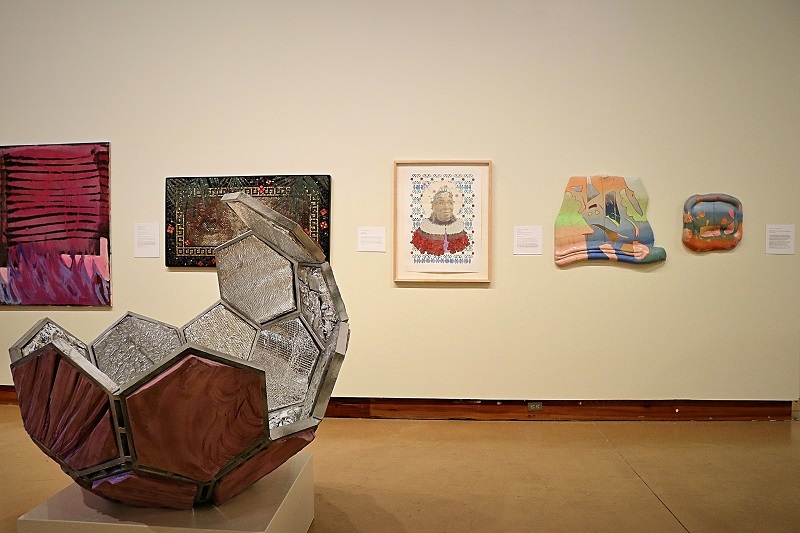 My work is centered in issues of ageism and its connection to hyper-consumerism. I made portraits of people who were all over the age of 60 as part of “The 60 Year Project” – age is the only requirement for participating in this project. 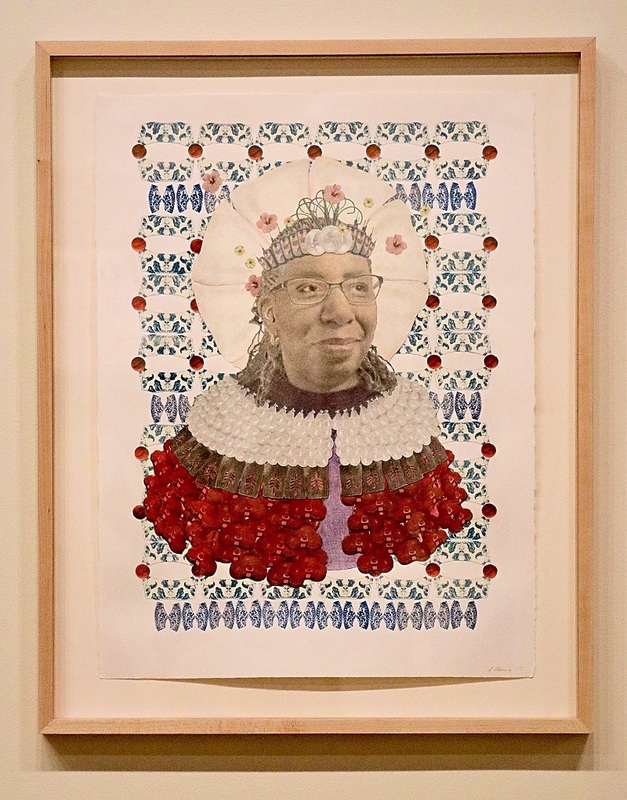 All of the portraits include crowns, halos, and royal robes made from images of found objects; items that were mass produced and then mass discarded in favor of something new, not necessarily something better. I’ve heard of this referred to as “the Detroit Syndrome,” in which consumers are encouraged see the latest and shiniest model as superior to the vehicle they already own. “The 60 Year Project” is all about shining a light on a demographic that is all too easily pushed to the back. Ageism and age discrimination remain the only socially acceptable form of bias. I have a zine series, “Aging in the 21st Century,” that addresses this and other topics that affect us all as we get older. The work at B18 is a screen print collage portrait of Florence, a regular at the COT Senior Center. In this image, she’s wearing ropes of “pearls” that are actually headlight bulbs, and is set against a background of bits and pieces of porcelain. I find these bits and bobs while out on walks or hiking, and to me, these pieces still have beauty and utility. A broken piece of a plate still has an interesting color, an interesting shape. I received a grant from Puffin Foundation LTD for “The 60 Year Project,” which helped fund an exhibition last December at Florida State University’s Claude Pepper Center. Senator Pepper chaired the House Select Committee on Aging during the 1980’s, and is best known for championing the rights of the elderly. This is my first time showing at the WMA. My husband, Jim, was in WMA B10, where his photo collage Waiting For Kate sold. He encouraged me to apply to this show. We drove up to visit the Wiregrass Museum and were both really impressed with the space and the staff. Not really, because juried shows come with entry fees of around $35 to $50. I pick and choose which art spaces I want to support, because those fees really add up. I’m very happy to pay an entry fee that goes to support the Wiregrass Museum. This summer I exhibited in a juried show at Tempus Projects in Tampa, ArtFields in Lake City, SC, and have showed at and supported 621 Gallery in Tallahassee. strong arts program? Did someone in particular encourage you to develop your practice? I’ve always loved drawing, even when I was a child. I later got a BFA with a concentration in printmaking, and then 28 years later got my MFA from Florida State University. I was 50 when I completed my Masters, and am glad to say there were a few of us in my age group in my graduate class. My parents were supportive of going into an arts program, and later my husband, Jim (we met in art school and graduated with our BFA’s the same year) was very supportive my getting an MFA. For one thing, artists keep things interesting. You hear a lot about how arts have value because they’re useful for tourism, business, education and so forth, and all that’s true. But I think it’s more important that truths can be expressed in one image, even if it doesn’t result in generating money for anyone. I currently live in Tallahassee because for one, we both have jobs here. Although the arts community here is fairly small, I have always found it to be hugely supportive. Many of us came out of FSU’s art program, so if we don’t know each other personally there is still that connection. Outside of FSU is Railroad Square Art Park and the All Saints District, which is the hub of the arts community here. I’m really excited to see the growing connection between Tallahassee and Dothan. It’s great to see this network of Dothan, AL, and Tallahassee, FL forming, and extending north to Atlanta and south to Tampa / St. Petersburg. I hope that all of us who live and work in these smaller towns can build and foster these networks. Found objects and their history interest me, and I use them a lot in my work. When working on the portrait series I spent a lot of time looking at Kehinde Wiley’s work. He recently received a lot of attention for his portrait of President Obama. I’m drawn to the way he has his figures floating in a patterned environment. I also love the work of street artists like David Zin, Levolet and El Mac. Yes! I am still looking for people aged 60 and over who want to participate in “The 60 Year Project”. I have an exhibition coming up next year at Tallahassee’s City Hall, and am looking for people of all ethnicity who can either send me or arrange for me to take a high resolution photo to develop into a portrait. Again, the only stipulation is that you must be at least 60 years old. Contact me at jamoke777@comcast.net if you’re interested! To learn more, see my website at www.amyflemingstudio.com.